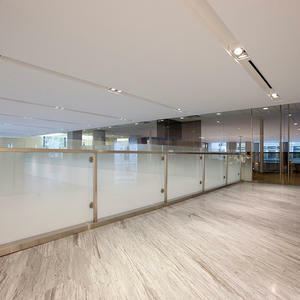 Right in the heart of midtown New York, across the street from Bryant Park and the New York Public Library, the newly remodeled HSBC Bank serves as an example of how VividGlass can dramatically enhance a space. National design firm STUDIOS Architecture brought us in on the project that utilized more than 2,600 square feet of our architectural glass. 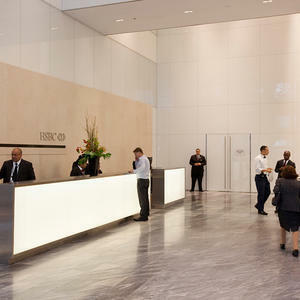 Three different glass products were used in the massive installation in the bank’s elegant lobby. 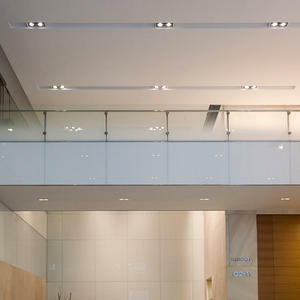 First, in the second floor area of the lobby, there is a pedestrian bridge with a railing system that showcases ViviGraphix Gradiance in Dot Mini Fade pattern. Second, the giant two-story South Wall features ViviChrome Scribe, a one-sided glass which helps give the space a clean, open feel. A band of ViviChrome Scribe also runs below the railing of the pedestrian bridge. 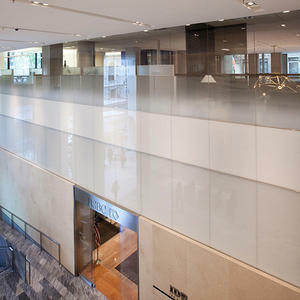 Third, between the two floors, ViviChrome Chromis View in White was used to create a subtly translucent band of glass. Originally, the architects had planned on using back-painted glass from another vendor for this area, but were unable to make it match well enough with the other glass elements. 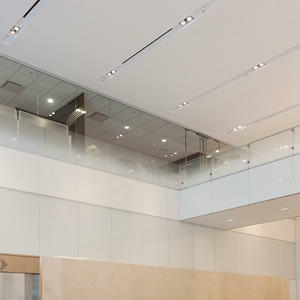 After three rounds of samples we were able to provide a match that looked great, allowing us to supply all the glass for the lobby. The project, which began in October of last year and wrapped up this past June, was divided into phases so it could be fast-tracked on the manufacturing side. Over a very intense three-month period, we delivered the glass panels on a schedule based on the client’s installation needs. 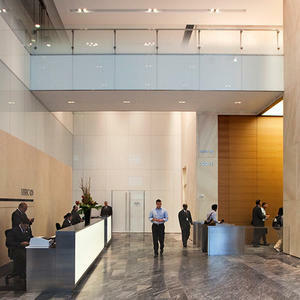 Take a look at our gallery of application shots and see what an amazing impact VividGlass can have on your project. For more information, visit the VividGlass section of our website, or contact us.